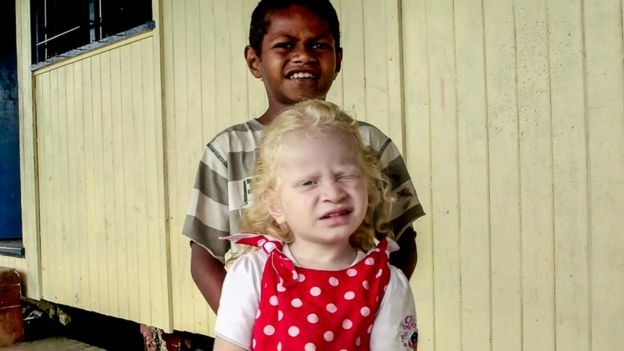 Fiji is a popular destination for travellers in search of tropical beaches and sunshine, but many visitors would be unaware the country struggles with an unusually high rate of albinism. A new film has highlighted the issue, writes Ben Collins. Christine Nestel called Fiji’s largest television station to ask if she could use footage from a talent programme. It was, she explained, for her documentary Coming Out of the Shadows. The clip shows Laisa Bulatale, a woman with albinism and one of the subjects of Nestel’s film. She was eventually put through to the CEO of Fiji TV Geoffrey Smith. He viewed her trailer and was so interested in the project, which is about the genetic condition, he said not only could she use the footage — he wanted to screen her film across the country. 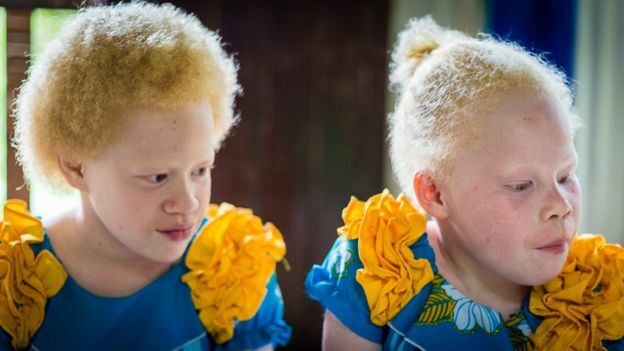 According to the United Nations’ independent expert on albinism Ikponwosa Ero, the relatively rare, non-contagious condition is genetically inherited. It affects people worldwide regardless of ethnicity or gender, and prevents the body producing a pigment called melanin. In order for a person to have albinism, both parents must carry the gene. In that case, there is a 25% chance that a child will be born with albinism at each pregnancy, says Ms Ero. In Europe and North America, it estimated between 1 in 17,000 and 1 in 20,000 have albinism, she says. In some indigenous populations in South America, the frequency is as high as 1 in 70, while selected populations in sub-Saharan Africa have recorded between 1 in 1,000 and 1 in 1,500. The frequency of albinism in certain parts of the Pacific is reported to be 1 in 700. Despite its prevalence in Fiji, the condition is not well understood there. That’s a problem for children with the condition, who, Nestel says, fall behind in school as it affects their eyesight. “One of the possible theories is that, if you live in an island community for example of 3,000 people, and even if your family chooses not to marry anyone in the immediate family, it’s possible that — five or six generations ago — you may in fact be marrying someone from the same original gene pool as yourself,” she says. Dr Whitfeld has worked in Fiji on and off for more than a decade and recently organised the country’s first albinism awareness symposium. She became involved after noticing a lot of young men with the condition had skin cancers. The film chronicles the experiences of people with albinism, as well as the challenges they and their families face, such as the high cost of sunscreen and lack of specialist schools. The melanin pigment is linked to eye development, meaning people with albinism often have poor vision. Many teachers, Nestel says, are not aware of this, and simply assume that children with albinism are struggling to understand their schoolwork. “Every time when I go in the bus, as soon as I enter, people start looking at me,” says Esala Seru, a person with albinism who was 14 at the time of filming. His mother, Ateca Rabukawaqa, says she used to be like a “policeman” for her son, trying to prevent people staring at him. Esala’s grades dramatically improved once he began attending a school for blind children, and he even became head boy. Soon after Nestel’s phone call with Geoffrey Smith, the film was screened on Fiji TV. But she was worried about Esala, who now attends a high school where he is the only person with albinism. “He was mortified about having to go to school on a Monday because it was screened on a Friday,” Nestel says. “The great that that happened was, when he went to school on Monday he was dreading it, but apparently the boys at the high school were slapping him on the back, and even hugging him. “They were hugging him saying, ‘my mum told me to give you a hug’.